Giant ichneumons specialize in parasitizing wood-boring horntail wasps. For more information and a picture of horntail wasps see the ISU Horticulture and Home Pest News from July 29, 2011. It is amazing that the giant ichneumon female can sense (probably by smell) the presence of a horntail wasp larva under the bark, in the wood of a tree. 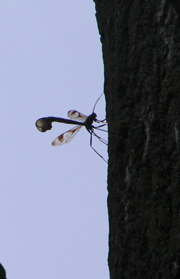 Then she uses her long, slender ovipositor to drill through the bark to lay her egg next to the unfortunate larva that will become the food for her offspring. 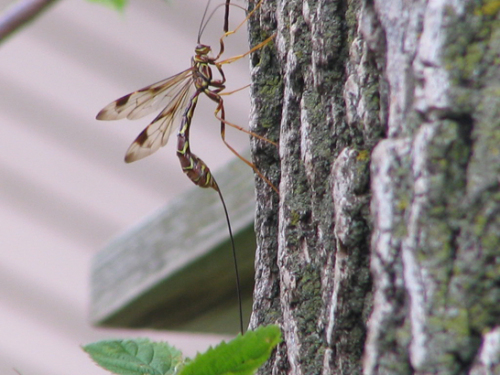 The presence of giant ichneumons on a tree is not a good sign because they are in indication that horntail wasps are attacking the tree. Horntail wasps attack trees that are already under stress. Often by the time the wood-boring insects have started attacking the tree is in irreversible decline. There are a number of things that can cause trees to decline. For some examples please see ISU Extension and Outreach pamphlet SUL 2, Understanding Decline in Shade Trees. Female Giant Ichneumon wasp. Photo courtesy of Erick Johnson. Giant Icheneumon female inserting her ovipositer into bark to lay eggs. Photo courtesy of Erick Johnson. Links to this article are strongly encouraged, and this article may be republished without further permission if published as written and if credit is given to the author, Horticulture and Home Pest News, and Iowa State University Extension and Outreach. If this article is to be used in any other manner, permission from the author is required. This article was originally published on May 16, 2012. The information contained within may not be the most current and accurate depending on when it is accessed.